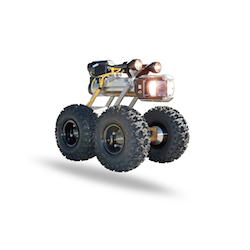 The Steerable Pipe Ranger II is a versatile robotic camera transporter designed to traverse silt, mud and debris commonly found in storm and sanitary sewers. It is designed with single-point wheel removal to facilitate speedy configuration changes for various pipe diameters and conditions. Optional high-traction tires are available for extreme slippery conditions. Contact the company for a free demo.